Canada's announcement, to be approved by the Bank's governors, was made by Maryam Monsef, the Canadian Minister of International Development and for Women and Gender Equality. 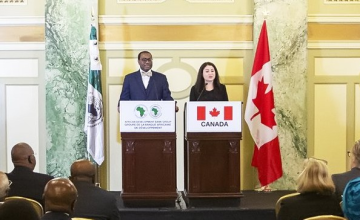 "I am happy to say that today, Canada is demonstrating its commitment to African countries and our confidence in the African Development Bank by announcing that we are going to subscribe up to US$ 1.1 billion in temporary callable capital, if required." Minister Monsef told members of the Diplomatic Corps based in Washington D.C., governors of the African Development Bank, executive directors, including executive director David Stevenson, who represents Canada, China, Korea, Turkey and Kuwait. The Bank's senior management team was also in attendance. On the sidelines of the World Bank-IMF Spring meetings, Maryam Monsef, the Canadian Minister of International Development and for Women and Gender Equality, announced Canada's willingness to temporarily increase its callable capital at the African Development Bank (AfDB) by up to US$1.1 billion, should it be required. Through this commitment, Canada is supporting the negotiations of the African Development Bank's Seventh General Capital Increase. The announcement was made a day after a meeting of the Bank's governors in Washington D.C. to continue discussions on a Seventh General Capital Increase.